Has this happened to you? You look at the beautiful cut of meat you’ve spent a small fortune on, you look at your charcoal BBQ with a little pride and a grumbling stomach, you then look down at your charcoal, scratch your head and repeat. It’s the question that challenges the best of us. How much charcoal do you really need for your cook? Unless you’ve nailed it through lots and lots of experience, we’ve found for the common backyard BBQ’rs, there are two main camps. 2. You light a few pieces praying to the BBQ Gods it will be enough to last the whole cook while not wasting any cause it can get damn expensive. Wouldn’t it be good to have the formula for fail-proof results? Realistically there are so many variables in terms of fuel type and quality plus the different BBQ cooking methods and equipment, it would be foolish to say we had an exact formula. However, after extensive testing of our own Firebrand BBQ Charcoal products over the years, here is what we’ve found that works. Firstly it’s important to note that the volume ratio of charcoal Briquette to Lump is about 1:1.5kg. So in terms of heat output and burn time you’d need 1 1/2 amount of lump to get the equivalent performance from a compressed briquette charcoal product. So with that out of the way, the rule of thumb is that the ratio of BBQ charcoal to meat that you need is 1:1. So for every kilogram of meat, you will need a kilogram of briquette charcoal or 1.5 kilograms of hardwood lump. In saying that, we’ve been able to cook 10kg of meat, staggered over an afternoon using about half a box of our Briquettes (about 5kg) due to the fact we knew we could get 5 hours burn time. So it’s good to figure out if you’re cooking it all in one hit, or staggered over time. This 1:1 ratio works for any kind of meat cut. Whether bone-in like a lamb leg or ribs, or boneless cuts like a brisket. You should calculate the amount of charcoal you need based on the overall weight of your uncooked protein. 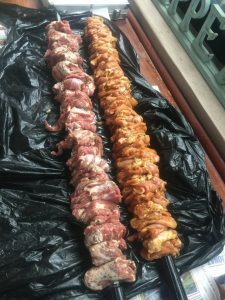 In this example below, two Firebrand Chimneys loaded with approx 8kgs Firebrand Rotisserie Grade Briquettes (red box, blue strap) was able to cook these two skewers of total 8kg meat on the Rotisserie (Skewer-Q Medium) for 4 hours. If you’re using briquettes for your cook and followed our earlier guideline, it may look like you don’t have enough charcoal for the quantity of the meat. Fear not! Remember that the heat output will be higher when using briquettes than a lump charcoal. Plus the fact we know that the Firebrand hex shape log briquettes have a higher heat output than a pillow shape bead style briquette. So how long does BBQ charcoal burn? In any open type of BBQ application e.g. direct grilling, rotisseries, skewers or churrasco, most lump charcoal products will give you 2-3 hours burn time whereas briquettes will push out to 4-5 hours. Of course, this depends on the quality of fuel being used. The more binders and additives in a product the less of the raw material in the log/briquette/bead so burn time could be lower. 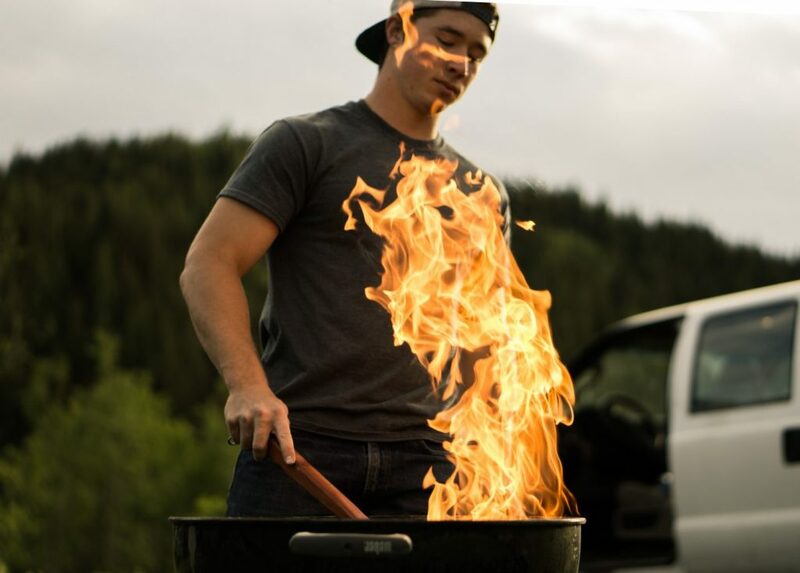 So if you experience a strong chemical smell when you burn your fuel, then most likely it has a higher quantity of binders and additives so take this into account as to the overall cooking time and be wary of placing your food over it if by the time it is white hot it is still giving off a foul odour. 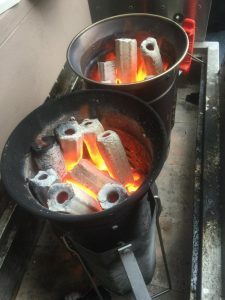 For those who like to mix briquette and lump, assuming the mix is half-half, you should expect burn time of somewhere in the middle approximately 3.5 – 4 hours. In a low and slow or oxygen restricted environment, for example, bullet and offset smokers, Kamado or Weber kettle (lid on) you can expect double the lasting time on average compared to the open grilling applications. So lump charcoal should burn for 4-6 hours versus your briquettes giving you a good 8-10 hours. Of course, every BBQ is different and these burn times are dependent on your fire management and ultimately how well you can control the airflow. More oxygen = higher heat. Less oxygen means lower overall temperature therefore prolonged burn time. Although no oxygen can mean that your charcoal can fizzle out and lose heat altogether. How do you add more charcoal during the cook? If you’ve tried to follow the guidelines but find your BBQ losing heat midway through the cook then here are some tips on how to add more. In an open grilling situation, we advise not to lay new un-lit charcoal over the top of your hot, lit charcoal. Reason being, there will probably not be enough heat in the existing charcoal to properly light any new charcoal anyway. 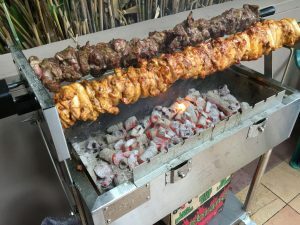 Plus, as juices from the cooking meat continue to drip onto the fresh charcoal it will make it even more difficult to get up to any sort of cooking temperature. We recommend lighting a new batch of charcoal separate to your operating grill for example in a chimney charcoal starter, then once it’s ashed over and is white hot, add the prepared charcoal to your cooking grill. The truth is that only through trial and error can you truly nail the amount of charcoal you need for your own BBQ. One thing we can guarantee though….it sure is fun practising! This entry was posted in BBQ Blog - all, BBQ Tips and tagged bbq, bbq charcoal, briquette, grilling, hardwood lump, kamado, low'n'slow, lump charcoal.